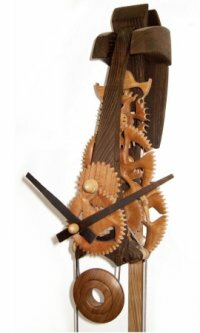 These designs were the result of a growing sense of dissatisfaction with the slightly clunky appearance of clock 10, and are an attempt to take an integrated approach to the shapes of the various frame parts. During the design process the weight cord pulley system evolved from the three wheel set in Series 10 to the more efficient two wheel set now incorporated Series 12. I like these clocks. I'm pleased with the new shape of the bracket which I feel fits nicely with the frame. Both different pulley yoke designs also work visually, now looking part of the whole. Series 11 proved challenging to make and were quite wasteful of wood; lots of strangely curved pieces and few straight lines - hence only 2 were made. That said, I'm happy to revisit this design if desired. These clocks need only one mounting screw, and actually are easy for the owner to install. They run reliably (and have done since mid 2008) and tell excellent time.